Waking up bright and early in the morning, I had everything lined up and ready. We arrived at the "hairport" with excited kids in tow. Everything was going smoothly. I freaked out the night before about the packaging on the carseats. A friend of mine commented that our airline had gigantic bags to slide the carseats into. This was correct. The lady at the airline desk wrapped them all up, took our luggage, and we all made it through security in one piece. When we all piled into the terminal to wait for our delayed flight, I was feeling pretty pleased with myself. Both girls were exploring their "pack packs," the baby was happily playing with his toes, and The Husband was filling his tummy with breakfast. 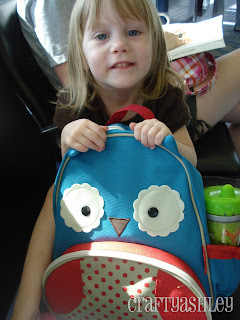 Owl pack-packs, one must have for flying with kids. Everything went so well! The only hiccup was the flight attendant. Seriously. We didn't buy a ticket for Little Man- I was fine holding him in my lap, but our flights were seriously underbooked, so I was able to bring the carseat along and park it in the seat next to me. That's when snooty flight attendant lady came up and asked if the carrier was strapped in. I hadn't even thought of it, I'd just sat down and was making sure everyone had everything they needed to be happy (and quiet) passengers. I quickly strapped the seat to the chair. That's when, with disdain dripping from her mouth, remarked, "We'll be going 150 mph today.... just something to think about." I almost died. Are you calling me a careless mother, lady?! Because you really don't want to do that, I assure you. I have spent weeks packing and planning this trip. And honestly, if our plane came crashing down to earth going that speed- I don't think strapping him in the seat would do much good at that point. I almost punched her right then and there. She came back 15 mins. later to ask if his harness was on. I lied. It so wasn't. I had my arm on him the whole time. Thankfully, he slept through the entire flight, and I had enough restraint to keep from maiming our flight attendant. The girls had a blast. 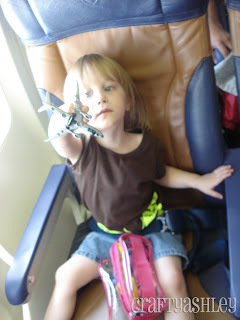 They loved every minute of the "hairplane" ride. After we arrived at our destination, both girls informed The Husband that a potty would need to be found asap. I waited outside the bathroom, with an infant strapped to my person, multiple bags by my feet. Let me tell you, traveling with children slows you down! More than you could know! By the time we made our way to baggage claim, the carousel was spinning, with only our bags on them. Literally everyone else on that plane had come down, picked up their bags, and went on their merry way. It was a ghost town. On the flight home, I vowed that we would get to baggage claim earlier. 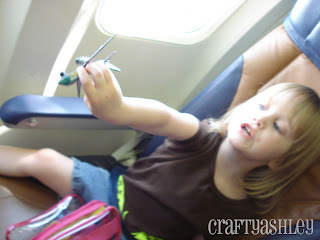 I darted out of the terminal, with just a stroller, while the girls went potty. I still missed everyone, and had to go searching for some of the luggage in the main office. Slow. Kids are slow. While the girls were majorly confused about rental cars, hotels, and sleeping without their stuffed animals, they were happy and content. (and the potty training was still intact!) I was so excited for the weekend ahead. And feeling pretty silly for blowing this little trip so completely out of proportion. I could now understand how friends took their kids out of town numerous times a year without batting an eyelash. Much less obsessing and blogging about it constantly. Glad you made it there safely! Love those owl backpacks! Can't wait to hear the details. I can not believe that flight attendant! Who does she think she is?!?! ?